When you think of ice fishing, what comes to mind is folks standing on the ice or sitting inside fish shanties. Whether it’s tipups baited with minnows or jigging with ice rods, the vast majority of ice anglers are hoping to hook fish fish swimming below the ice. But then there’s the darkhouse anglers. Rather than hook fish, they’re inside darkened shelters hoping to spear pike. Take on a new challenge and explore a different way to enjoy the FREE FISHING WEEKEND. Any lake with a good population of pike and water clarity of at least six to eight feet offers spearing possibilities. Although Lakes Mitchell and Cadillac are darker than Crystal or Torch Lakes, there’s still good visibility down to ten feet. Spearing is a big deal here. Steve Knaisel, owner of the Pilgrim Village Fishing Shop had 130 signed up for his annual pike spearing contest, an event that’s been held for 15 years. Looking at his leader board, it was apparent that darkhouse anglers take the larger pike with many in the 30 to 36 inch range. Inside a spearing shanty,more commonly known as darkhouses, what catches your eye is the giant rectangular hole, often about 28 or 30 inches by 36 inches, which takes up most of the floor space. In contrast to the dark interior of the shanty, the hole is lit up as if illuminated from an underwater source, which in this case is the sun shining through the ice. To help see fish swimming beneath, a layer of potato slices or egg shells is spread over the lake bottom so the dark fish will standout against the light background. Once the hole is ready, the waiting begins. Sitting by the edge of the hole, the angler watches for a pike to appear. Many find it soothing to look down at the quiet lake bottom. They will tell you the hours go by quickly. To entice these fish into showing themselves, plastic or wooden decoys are used. The decoy is weighted and balanced so it will swim level. When the line is pulled, the decoy minnow glides about in smooth arcs. The attractors should be suspended several feet off the bottom so they can easily be seen by cruising pike. The carving of decoys is recognized an an art form. The most famous carver was Oscar Peterson, a Cadillac resident, who created decoys up to his death in 1951. Five of his decoys are on display at the Smithsonian in Washington DC and he has a collection at the Museum of American Folk Art in New York City. Today a Peterson decoy sells for $1000 to $6000. One of his sold at an auction in Sotheby’s in New York City for $18,700. While many spear anglers use artificial decoys, some prefer natural bait, live sucker minnows up to a foot long. Pike are unpredictable. Sometimes they’ll will just float into view and eye the decoy. At other times a pike will rocket into the hole at what seems like a 100 miles an hour and either grab the decoy or just fly on by – appearing as little more than a blur to the the anglers sitting above. Spear anglers will tell you that it’s that moment when a pike slides into view, that makes the waiting worthwhile. Although adrenalin may be surging, moves need to be slow and deliberate as the spear is lowered into the water so that when it’s dropped there won’t be a splash. The sweet spot is just behind the eyes where the back is widest. 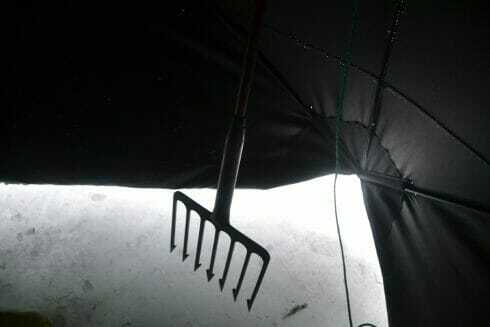 Hit the pike there and it should stay on the tines as it is hauled into the shanty. While catch and release allows fish to be returned live, there’s no spear and release. To avoid the chance of killing an undersized pike, most spear fishermen give themselves a margin of error on the 24 inch minimum size by not taking fish under 26 or 28 inches. If spearing sounds intriguing, the Michigan Darkhouse Anglers Association website is worth checking out. Here, in addition to a collection of photos of anglers with their catches, and a history of spearing, information is put out telling of workshops with how-to information for getting stated in spearing and decoy carving.